Located 15 kilometers from Cairo city, Cairo International Airport is the busiest international airport serving Egypt. With more than 65 airlines flying in and out of Cairo International Airport, this airport is also a hub for EgyptAir. With total three terminals, Cairo International Airport serves flights to and from all around the world and airlines scheduled are Air France, Czech Airlines, Air Berlin, Afriqiyah Airways, Gulf Air, Saudi Arabian Airlines, EgyptAir and EgyptAir Express. Being the most important international gateway to Egypt, Cairo International Airport is fully loaded with terminal facilities like restaurants, cafes, banking, internet cafes, lounges, duty free shops, first aid and parking facilities. 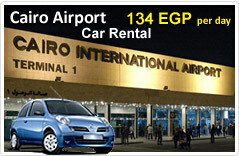 Cairo International Airport also has car rental desks from some of the major firms like Egypt Cars Rental. Cairo International Airport serves the capital city of Egypt, Cairo and a car hire is cheapest means of ground transportation to reach to this city. When you book a car for Cairo International Airport, you can easily drive to Cairo's amazing attractions. Whether its old Cairo city, Giza Pyramids or the Khan al Khalili bazaar, Cairo has so much to explore. Visited by both business and leisure travelers, Cairo is a center of some of the most entertaining attractions like The Egyptian Museum, Cairo tower, Qahira Fatimid Mosque, Ramses II Statue, Asfour Crystal Factory and many more. Cairo car hire means you can also drive to cities in old town and areas nearby Cairo, at your pace and plan. Egypt Cars Rental is a car hire provider covering all the major cities and international airports across Egypt. Our prices include easy online booking, secure transaction, collision damage waiver, insurance, no cancellation fee and customer support. We let you drive from Cairo international airport to anywhere in Cairo city, at your convinince.